Here, New Orleans chef Michael Gulotta breaks down his extraordinary pepper jelly clams. Southeast Asia and the American South have more in common than climate. According to New Orleans chef Michael Gulotta of MoPho, both regions have river deltas where brackish water leads to clean water, “and that’s where you get great seafood,” he says. 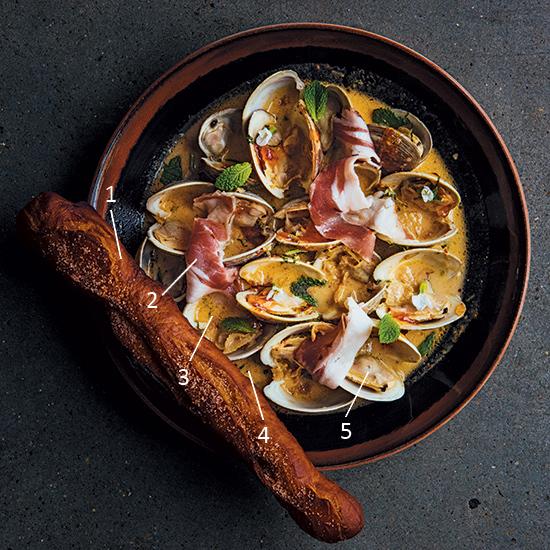 He highlights some of it—extraordinary littleneck clams from Cedar Key, Florida—in a dish inspired by a Thai classic. 514 City Park Ave.; mophonola.com. Bright red annatto seeds lend electric color to bread made with beignet-style yeast dough. Gulotta spikes the braising liquid with a not-too-creamy Thai coconut milk called Chaokoh. “The broth should be drinkable, like soup,” he says. Gulotta makes his version of the Louisiana condiment by cooking down a mix of chiles—Anaheims, wax peppers, cayennes and serranos–with grapefruit or orange juice. A local farmer sells surplus lamb bellies to Gulotta, who presses and cures the fat to shave over the clams.